Selectman and board chairman Tristan Israel signs letter of withdrawal from MSBA. 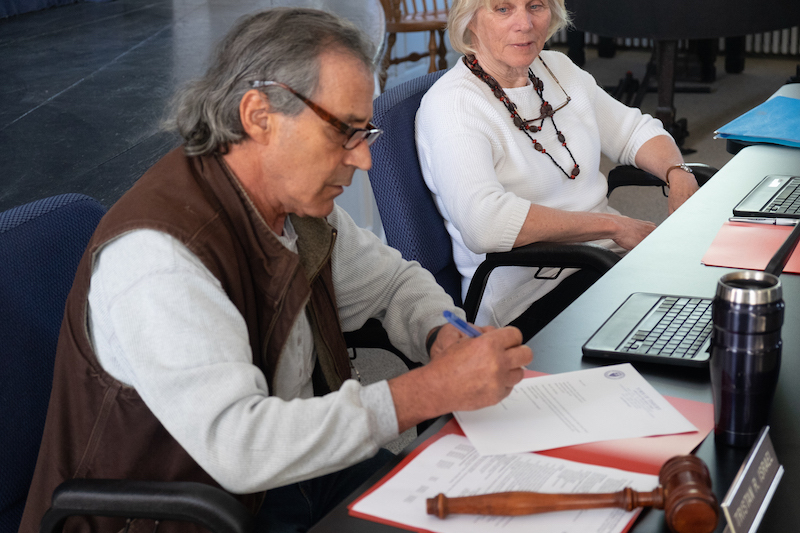 With little fanfare, the chairman of the Tisbury selectmen signed a letter to the Massachusetts School Building Authority (MSBA) on Tuesday, officially withdrawing from the school building process. The letter marks the formal end of the $46.6 million new school project that failed in the ballot box at the annual town election last month. The town will forfeit some $14 million in state reimbursement money and return to square one on the new school project. Last week the school building committee had voted to ask the MSBA for more time to consider its options. But the selectmen declined to endorse the request, effectively ending the process. The letter to the MSBA was signed by selectman Tristan Israel, superintendent of schools Matthew D’Andrea and Tisbury school committee chairman Amy Houghton. “The town is moving in a new direction to begin to develop a project that has greater support from the community,” the letter says in part. It also thanks the MSBA for collaborating with the town and explains that cost was a major concern for voters. An addendum letter was also sent that said many in the community also had qualms about demolishing the existing building. Selectman Melinda Loberg said Tuesday that the addendum letter was added as a separate note because the original letter was already written and signed. Meanwhile, bitter feelings linger over an issue that has been deeply divisive for the town, and the next steps are unclear. “It’s felt like for the last two and a half years we’ve followed a script,” said school principal John Custer, speaking about the MSBA process. “Now that script is gone, so it’s a little unsettling to not have an idea what’s happening next or when that’s happening,” he added. “I think everybody’s just taking a little time to take a deep breath,” school building committee chairman Colleen McAndrews said. She said she was grateful for the MSBA’s support over the past two and a half years. The school was accepted into the highly competitive school building process on its second attempt. Mr. Custer first applied in 2014. At the regular Tisbury School committee meeting this week, discussion about the next steps was limited. “There is a lot of dissonance in the town right now,” said Reade Milne, a parent and member of the school building committee. But she and many others involved in the process said they hope to see the project move forward with a fresh start. There is consensus on at least one point: the aging brick school needs immediate work. Town administrator Jay Grande and town facilities manager Kirk Metell met with Mr. Custer last week to informally discuss the needs. As for a more extensive school building process, Ms. McAndrews said she is looking to selectmen. “My hope is that town leadership will take advantage of this opportunity to get everyone on same page moving forward,” she said. She added that the group working on the new version of a project will likely be different. “I don’t think it would be productive to bring the exact same people back to the table,” Ms. McAndrews said. Mr. Grande, who also sat on the building committee, said the MSBA process has provided a trove of valuable information about issues with the existing school, and that information will prove useful as the town moves forward. “I spent the day downloading a lot of documents as it relates to renovation of the building,” he said on Wednesday. School committee chairman Amy Houghton echoed the value of the process, saying the committee had the opportunity to learn from the MSBA, Turowski architects and project manager Richard Marks. Newly-elected selectman Jim Rogers said there is no time to spare. “I want to start the process over again as soon as possible,” he said. “For me, the key is wide-based support.” Ms. Loberg agreed. 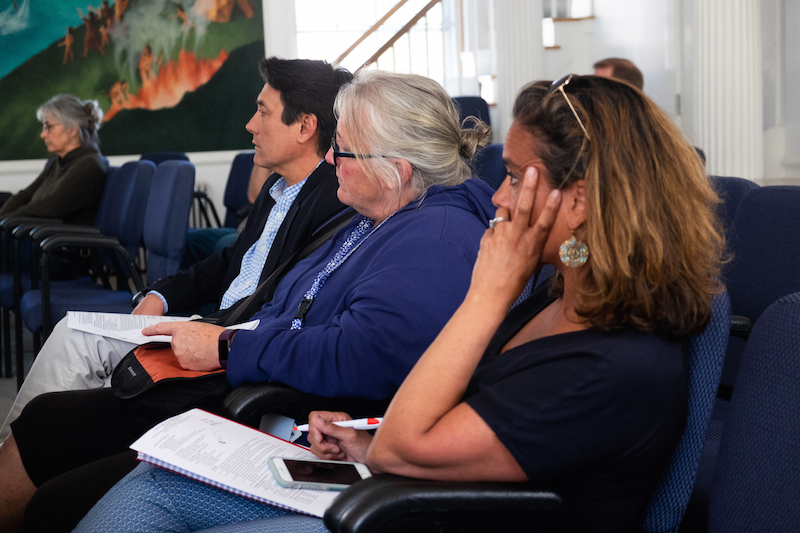 “I happen to be very excited about getting underway with a new plan,” she said, adding that she would like to begin with a joint meeting of the selectmen and school committee. Board chairman Tristan Israel said the town needs time to process the failed vote. Mr. Custer said he always looks for silver linings. As the town waits for a formal response to its withdrawal from the MSBA process, Mr. Grande said the school will be on the selectmen’s agenda for the May 22 meeting. Look at the nice rehab of the Mullen/Hall school in Falmouth,It can be done. It can be done in Tisbury,to a beautiful historic school that should have had things done YEARS AGO ! Quite right. I pointed to the example of the Mullen-Hall School last year. Jeff - A lot of things should have been done YEARS AGO in our town. But we're stuck in the past here. Our selectmen are good at saying one word - "No". I'm not sure what the legacy of this current slate of selectmen will be. At least Ernie Boch, Jr is trying to accomplish something to help our town despite objections from our town 'leadership". Tisbury: Just say NO. I ageee with you JB. Embarrassingly poor leadership. The Shop & Shop debacle and the mess of downtown is a clear indication that they all need to step aside and let the next generation lead. I once overheard a family from Chicago chatting on the ferry and I will quote them verbatim. “ I hope the rest of the island doesn’t look like this ?” I politely leaned over and said “ Edgartown! Mullen school was a 14 million for project completed in 2003. Has anyone noticed that was 15 years ago and the building was on the national historic registry and just to be sure we all understand, that 14 million spent 15 years ago does not include the cost of doing it on the island. Yes it can be done but not for 14 million with this building. Move forward and stop all the ancient comparisons. $14 million in 2003 is a little over $19 million in 2018. And the Mullen Hall school is a lot bigger than the Tisbury School. 80,000 square feet for 500 students, not barely 300. They got a complete renovation and expansion. The school is described at Falmouth's most important civic building. The same can be said of the Tisbury School. In fact, when it was built the Tisbury School was considered one of the only significant civic struftures on the whole Island. It should be on the National Register, and I hope the Tisbury Historic Commission will make the needed moves to achieve this. Just because it can be done doesn't mean it should be. This is sad. This town is separated by 21 votes with people continuing to speak in ugly tones that most of the time are incoherent. This standoff begs for leadership. Town leaders need to step away from this "scrum", and understand this town can begin to feel good about itself if something is visibly accomplished. But comments like, "there is little that can be done...this town is built out", that one selectman uttered at town meeting has to end. All of us know what can be done, requiring little pain but hard selectmen work, such as restart discussions with Stop and Shop (we are tired of traveling to Edgartown), get Beach Road fixed, keep the town picked-up and streets cleaned with side walks repaired, figure out how to make the behemoth MV Museum pay to the town coffers, sell or invest in vacant town property. Less vile talk from taxpayers and more work from the selectmen would be welcomed by all of us. So this is a wrap. I am sure lots of people have talked to the selectmen/woman and that is how they got the data for their additional letter. I hope it was all of the 567 no votes otherwise it is not the sentiment of the town and they might not consider adding opinion and stick to the facts. There was no option in the ballot to state why you voted yes or no. What gain came from anecdotal information to the MSBA? Does everyone feel better? I will continue with my bold questions. Since there are pressing needs up there at the school, how about the selectmen/woman and planning board have an emergency town meeting and put a hold on Owen park expenditures and really kick start this new phase of the Renovation/addition process. The town has spoken about what they want, lets see an earnest effort to move that way now and not in 3 years. If you think i am joking about 3 years......here you go. Town will not likely choose to go it alone and wants MSBA money(or do they?). We apply in April of 2019 after town meeting and hear late in the year if we are accepted into MSBA money. Then in March of 2020 we go to town meeting and ask for funds to study and prepare a plan for a March of 2021 town meeting and subsequent 2 and 1/2 override if we can even do it that quickly. That is 3 years from now. Should we defer further significant overhaul until 2021 at the earliest while this plays out? The silent majority needs to wrestle with this question before any further criticism. The cycle starts over. Remember, 3 more years of "the temp trailer" then another 2 of a sea of trailers and 2.5 million disposable money on those in addition to whatever the final plan costs. It would be great if we could do it for 14 million like the Mullen school did 15 years ago. Re "There was no option in the ballot to state why you voted yes or no. " There never is. It is, actually, none of anyone's business why a person votes a particular way. Is this an example of a "bold" question"? I don't know where you get your assumption that no renovations will be done for three years. I think you may be out of the loop. I need to stop taking the bait and reading all this stuff. You adeptly strengthened my point. I was directly criticizing the Selectmen's letter to the MSBA. They don't have anything other than anecdotal evidence from how ever many people that spoke to them. I am confident that they represented the information that they have accurately, they just don't have empiric data to make a claim on behalf of the entire town without having collected it in an organized manner. You correctly made the point that they don't have it. Criticism still valid. Please, Please tell me you don't want to spend taxpayer money without a formal comprehensive plan in place and just begin renovations in the later half of 2019 all willy nilly after approval of the expenditures at town meeting and ballot box! If you think we should have a plan, that is accomplished with hiring the correct architects/engineers to study our building and needs, recommend a path forward for renovation/expansion and then we bring in a project manager to execute that plan after we approve all this expense. Wait, this sounds familiar. It will be different this time because the direction is now clear. It took 3 years last time. We can do it in less time if you don't want the guarantee of acceptance into the MSBA as a precursor to spend. Are you suggesting we foot the bill for the whole thing on our own? I'd like to remind the selectman that we no longer use snail mail. Email and texts are the way of the future. You could have had the curtesy to send the school committee and Mr. D'Andrea a quick email of the letter"added note" so they were informed of your surprise "note". Must feel good to catch people off guard. However, is it the way to run a town. Transparency is needed. Gotch moments are beneath Jay Grande and the Boatd of selectmen (woman), at least I would hope so. Sadly however it Doesn't seem to be the case. While you out-of-towners who know so much and have nothing but criticism and opinions to offer are busy tearing up Tisbury and our Selectmen, let’s get something straight. A majority of the voters chose to deny this project. A majority of the voters re-elected Mrs. Loberg last year. A majority of the voters re-elect Tristan every three years. We are the geographically the smallest town with over 400 businesses, the most of any town, and yet 87% of our taxes come from residential housing. And, the commercial tax rate is the same as the residential tax rate! Don’t forget to complain about how unfriendly Tisbury is to business. We will continue to fight for what is right for Tisbury. We have decided to save our school building. You will have to live with it. The sky is not falling. Before we make pronunciations of saving decrepit old buildings that will be substandard forever let's hear the cost first, and let's have a good understanding of 2003 prices in 2020, as some clearly do not. Also let's understand what that would involve. That would involve students being in trailers for a long time, and I highly doubt the parents and teachers of VH will accept that. Does anyone know what the Mullen Hall kids did for years? And in the mean time I'm pretty sure there are a bunch of people now that are unlikely to vote for Ms. Loberg or Mr. Israel, or their agenda ever again. I can't wait to vote no on every single sewer/wick thing that ever comes up. “I highly doubt the parents and teachers will accept that” Really? This is a classic example of the tail wagging the dog. The teachers and parents should follow the children’s example and be more resilient. The options have not been explored yet, and the sky is not falling. You are putting up blockades that can only lead to more division. Stop. Please. Has anyone had the brilliant idea of putting the administration in the trailer and the children in the school building? Yes, someone has! Putting up blockades? You mean like the selectmen? What will we be accused of next? Giving back millions to the state? Not listening to professional engineers? If you want to be in a trailer for years go for it. If you want to get together MV town leaders to discuss building a regional middle school so we can have yet another school building, administration, and school committe on the island go for it. But I'm voting no. I'm voting no on kids in trailers. I'm voting no on things engineers say is a bad idea. I'm voting no on other projects. I'm voting no on things that don't have state funding behind it. I'm voting no on anything that ends up not meeting modern standards. Voting no goes both ways. I will happily vote for any on the selectmen that concentrate on forcing the 5 corners people to clean up their dumps It's not like they dont have the money! Then get rid of that nasty looking dump boat at packers. That could be such a nice ride for newly arriving people instead of people saying "What a disgraceful mess, cant wait to get to Oak Bluffs". I think there is a fundamental lack of understanding as to why we voted this down. For me and 10 others it was the fact that 46M was too much. Nobody is arguing the need for a better building. Show us a plan to do this as suggested below (19M?) and we might give you your school. You're not building a new school that meets current standards on Martha's Vineyard in 2020 for $19mill. I highly doubt you are even renovating for that. The Edgartown Library was about 10-12 million, and didn't require demolishing anything, and that was now a few years ago. It is also far smaller, and is built as a library, not a school. Amazingly we were set to get millions more from the state than the entire cost of the Edgartown Library project. But we turned it down because....too expensive. Here's another way of looking at it....the town's budget is about $25mill. The school would be $46mill with $14.6 from the state. So that would be like if you earned $25K per year and then bought a $46K house, only someone was giving you $14.6K. Now you have to pay the rest over 20 years, and fortunately it's a time of excellent interest rates, and you live in a town with one of the lowest tax rates in the state. Financially this was a slam dunk. It seems people that simply misunderstand basic finances have really really really hurt the town, if they actually think this is simply unaffordable. If you can't afford this, then you can't really afford anything. The FinCom was 6-0-1 in favor of this project. People need to stop associating the word "cheap" with "good." "People need to stop associating the word "cheap" with "good." " Amen to that. And that also goes for "cheap" money. "It seems people that simply misunderstand basic finances have really really really hurt the town," You know, the voters are sick and tired of being told they don't know what they are voting for and they don't understand either the town's finances OR THEIR OWN. As for "hurt the town," first, that at concern trolling, and second, the no voters are the ones who have saved the town from a financial black box and an ungainly, inappropriate building. You have yet to grasp that you are in a minority. The state isnt carrying much of the burden here. The Edgartown library grant was almost half and we did tear down the old Edgartown school. The state should pick up half and 14.6 is a long way from that. A building does not make a great learning environment, good teachers and solid administration do, so they won,t build you a new school house, then get to work and make great students .